Watkins Petro Carbo Salve - The Drawing Salve! This stuff is really amazing, Watkins Petro Carbo Salve is a first aid kit in a tin! Sometimes known as the black drawing salve, although the salve isn't black in color any longer it still has the same drawing abilities. It actually helps draw out slivers and other small foreign materials emedded in your skin. 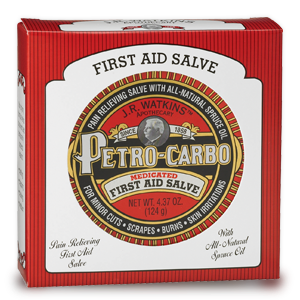 Petro carbo is a protective, soothing, healing topical dressing that is safe and effective for relieving pain and itching associated with minor cuts, burns and scrapes. It has antiseptic, antifungal, and anestheic proterties. With Watkins your satisfaction is always guaranteed or your money back! Request your free Watkins full product catalog and order by mail or phone. You have no idea how long i have been looking for watkins and for the petro salvo salve! We used for all the normal uses, thorns boils and the such. But we also used it on acne. Believe it or not it worked! Sucked the nasty stuff out and then just a good cleaning twice a day and the salve at night. I have wasted so much money on cleaners and scrubers and facials and I'm telling you nothing helps. And I keep talking about this salve. So now that I found you I have put in my first order and ordered a catalog also. I just wanted to share my story and can't wait to get my products! The reason why I contacted you was that my mother used to sell Watkins Products. She was born March 29th 1899, I am still using Watkins Petro-Carbo Salve in a 5/8" x 1-1/2" red tin. There wasn't any date printed on the tin. I think these tins were sample size tins, I could be wrong. I am 68 years of age, I can remember using this salve when I was a kid. It's now 5/5/2007 and this product is just as good as when I first used it as a kid. I burned my finger on the fry pan I was using the salve took the pain away with in minutes. I thought you maybe interested in how great this product is. We have four children who are are very active outdoors. When ever they hurt themslves we always have our tin of Petro-carbo handy for everything from scraped knees to drawing out slivers. It seems to sooth the pain and they are off playing again in no time. I'm always amazed at how quickly they heal. My husband is bed ridden and he developed several sores on his back. We've found the only thing that has worked to relieve his pain and heal the pressure sores is the Watkins salve in the red tin. Do you have something to say about Watkins Petro Carbo Salve? We'd love to hear from you! Order now and see for yourself, shop the JR Watkins store and conveniently pay with your credit or debit card. Did you find this page helpful? Please be a sweetie and share it, add it to your bookmarks or favorites so you can easily find us again. Note: Your customer account # and State/Province is optional, entering them will simply enable us to provide you with better service. I care about and respect your privacy. Thank you for visiting! Our door is always open and I look forward to serving you. * Note: Testimonials are based on personal experiences and we cannot guarantee these same results for everyone. The Federal Food, Drug, and Cosmetic Act requires the following statement: These statements have not been evaluated by the Food and drug Administration. This product is not intended to diagnose, treat, cure, or prevent any disease. In Canada, this information is provided for educational purposes only. No claims are being made for any product. Always consult your healthcare or medical professional for advise.